Plans to cut 800 jobs in Devon and Cornwall as part of a china clay firm's reorganisation will hit the entire South West economy, MPs and unions say. Imerys said the changes were necessary to protect the future of its business. It is blaming high energy prices, a weak dollar and strong overseas competition for significant losses. More than 700 jobs will go in Cornwall as Imerys consolidates its operations. 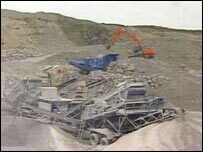 Up to 85 jobs will go in Devon as the company closes its pit at Lee Moor. The 800 redundancies amount to almost half of the French company's 2,000-strong workforce in the region. It is Cornwall's largest private employer. Some of the current operations carried out in Cornwall will be moved to Brazil. An Imerys spokesman in St Austell, Cornwall, said that the company was "hugely saddened" by the "devastating news". But the Transport and General Workers Union reacted with anger to the announcement. T&GW National Secretary Jennie Formby said: "It's no good an Imerys spokesman saying the company is disappointed by its own announcement. "This will deal a huge blow to the local economies in Devon and Cornwall, and the South West generally." Truro and St Austell MP Matthew Taylor compared the news with the closure of the MG Rover car plant in Birmingham which resulted in 6,000 job losses. He said the industry in Cornwall "simply can't afford to lose jobs on this scale". He said: "I am doing all I can to change this." "I'm shocked and devastated, as I think every employee of the company will be, and as the whole of the china clay community will be. "I've already told the company that I want to meet them this week, and I know the unions will be doing what they can." South West Devon MP Gary Streeter said he was also "deeply disappointed" at the news. He said: "Clay mining has been a part of the local landscape at Lee Moor for centuries and I will be making urgent contact with Imerys to discuss the issue and see how I can help." Imerys said that a consultation process would be started with unions on Friday and that it would support staff made redundant and provide financial advice and counselling for all employees. It added that it was to invest £25m in Cornwall over the next two years to secure its operations there. The china clay industry in Cornwall was started 260 years ago this year by English China Clays, which was taken over by Imerys in 1999 for £756m.